The ADIS16204 is a fully-contained programmable impact Sensor in a single compact package enabled by the Analog Devices, Inc. iSensor integration. 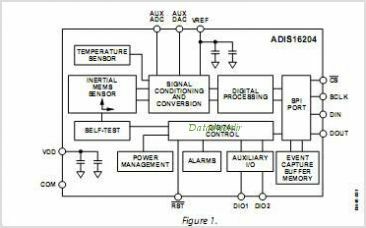 By enhancing the Analog Devices iMEMS Sensor technology with an embedded signal processing solution, the ADIS16204 provides tunable digital Sensor data in a convenient format that CAN be accessed using a serial peripheral Interface (SPI). The SPI provides access to measurements for dual-axis linear acceleration, a root sum square (RSS) of both axes, temperature, power supply, an auxiliary Analog input, and an event capture Buffer memory. Easy access to digital Sensor data provides users with a system-ready device, reducing development time, cost, and program risk. Unique characteristics of the end system are accommodated easily through several built-in features, such as a single command in-system bias null/offset calibration, along with convenient sample rate control. Peak Sample and Hold Programmable event recording (dual, 1K 16 bit) RSS output (total shock in the X-Y plane) Configurable alarms Auxiliary 12-bit ADC and DAC Configurable digital I/O port Digital self-test function The ADIS16204 offers two Power Management features for managing system-level power dissipation: low power mode and a configurable shutdown feature. The ADIS16204 is available in a 9.2 mm 9.2 mm 3.9 mm laminate-based land grid array (LGA) package with a tem-perature range of 40C to +105C. This is one package pinout of ADIS16204,If you need more pinouts please download ADIS16204's pdf datasheet. 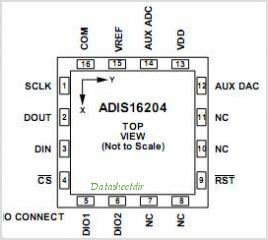 This is one application circuit of ADIS16204,If you need more circuits,please download ADIS16204's pdf datasheet.